Weeknotes 18: The blog in the woods edition. The website has had a design overhaul and the blog clearly hasn't sorry about that. No real thoughts here, just some updates about things all in one neat package and place. I've got a new project, three short films collectively titled the Monopoly of Legitimate Use. That's the trailer up there. The films are a culmination of writing and talking over the last few months to a year and deal with ideas around technopolitics and political action on networks. It's a joint commission from Lighthouse in Brighton and HOUSE festival in response to this year's themes of migration and refuge. I wanted to look at how these themes also a apply to a vertical geopolitics. There's a full interview about it here with Natalie Kane from Lighthouse. I've also embedded the soundcloud upload of the interview below.I'll upload the trailer and some more info as a project after the exhibition opens. I'll also be doing an 'in conversation' thing with Anab Jain of Superflux on the evening of the 15th of May which promises to be super fun. Link here. Last year I was commissioned by Z33 to produce Mercenary Cubiclists for their show Design Beyond Production at the Milan Design Salone. This year they decided not to do a show but invited me back to take part in a series of onversation pieces aimed at kicking off their awesome looking research wing. Jan Boelen and I chatted about futurism and design and I've embedded the video below. There's also an abbreviated version on the project page. 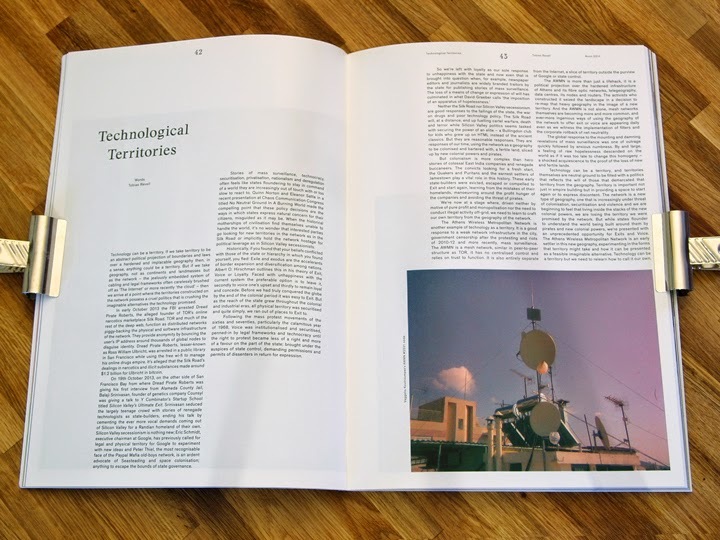 I wrote an essay for Noon magazine called 'Technological Territories' mostly talking about the kind of things I'm interested in. I've put it up as a project here. The magazine's pretty eclectic and it's worth checking out just for the sheer range of people and subjects in it. You kind of have to be some socio-cultural mega-whizz to have heard of everything going on there. Into Your Hands on exhibition again. Into Your Hands is going on exhibition again. This time at V2 in Rotterdam as part of the biennial. It's still on exhibition at Ars as well. How? There are two copies. This time it's going on exhibition with all the other projects form the Blueprints for The Unknown project so it's going to be like some crazy family outing. There was loads of other stuff, New Mumbai was on exhibition at the V&A as part of what looked like an amazing event for Synthetic Aesthetics. I couldn't make it but it was apparently awesome. I spoke at FutureEverything about making monsters for design fiction and I'll get the video up for that when it's out. Upcoming is some stuff at IMAL in Brussels for the connecting cities network - the Urban Media Lab masterclass, some more work with those amazing folk at the UrbanIXD project that blew me away last year with the summer school in Croatia, two or three things I'm getting dirty with for the Venice Biennale and some more awesome stuff from students at the RCA and LCC. New Mumbai is also going on exhibition at the House of Electronic Arts in Basel, there's also a ton of interesting things happening at Superflux and a super secret (for now) mega-exciting announcement from some regular collaborators in the next few months.